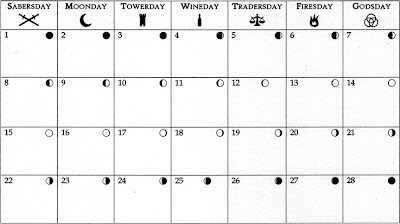 I decided to keep the calendar of Arden close to our own regarding the number of days. There are 364 days in a year. Over the year there are 13 cycles of the moon. Each month is 28 days long, the length of one of the moon's cycles. The phases of the moon. Each month starts and ends with the New Moon as it spans two nights. So the 1st and 28th day of each month is a new moon. The Full moon falls in the middle of each month spanning the 14th, 15th, and 16th. 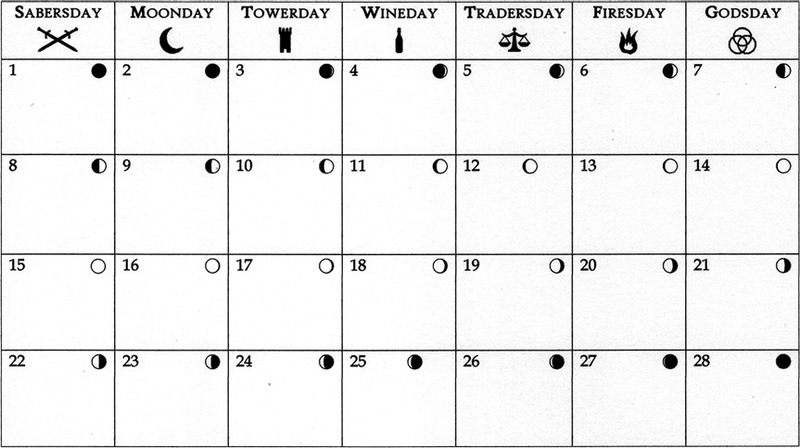 The days of the week are based on the weekly schedule of ancient Nehar. Sabersday was the traditional day of drills and review of the militias. Moonday was meant to honor the past and revere the dead. Towerday was the when scouts and patrols would return to report the happenings in the countryside. Wineday was meant to celebrate friend and fellowship. Tradersday was the day when merchants would set up in the bazaars to sell and barter their wares. Firesday as the day of homesteading, meant to make sure the home was safe and prepared for any dangers from the wilds. The final day was Godsday, it was set aside to honor the gods and thank them for their blessings.